But the fact is, we just like these quotes too much to let them go unnoticed, even as today’s battle between Joan of Arc and Mary Magdalene opens the Round of the Saintly 16. Thus we offer you a few examples for your reading pleasure. Our initial reaction to this one was “she called us leaders of the church!” Then we replied: “Actually, the leadership of the Episcopal Church in the USA belongs to Presiding Bishop Katharine Jefferts Schori and Bonnie Anderson, President of the House of Deputies. They are not boys. On the other hand, Lent Madness is meant to be fun. If it is not fun for you, we’re sorry. Really. Others are enjoying the festivities while they learn about God’s work in the lives of women and men through history.” Plus, it’s no longer called “genuflecting.” It’s Tebowing. Well, besides Jesus wandering in the wilderness for 40 days. Sounds like someone needs to take their three-legged stool (Scripture, Tradition, Reason) in for repair. 60 Comments to "Unsaintly Vibes"
Thanks for this great game. You have energized my morning routine: Morning Prayer, Exercise and Lent Madness. What a way to start the day! This article is as funny as anything I’ve read on this whole ride. Keep up the good work, Supreme Executive Committee! Very subtle bias here on the part of the Supreme Executive Committee. Nothing like drawing attention to the violence of the Roman persecution in order to question the holiness of Joan of Arc’s mission. All of the army imagery in this post is clearly linked to an obviously fabricated backlash against the glory that is Lent Madness… (As if folks could be that slow not to recognize the genius of this bracketed sanctity?! Your deft subterfuge will not sway me, or any of Joan of Arc’s faithful fans! What do you get when you complete an Arc? A HALO, THAT’S WHAT! You’ll have to try harder than this, guys! JOAN! JOAN! JOAN! My grandmother use to say, “If you can’t have a good time with the Lord, who else is there?” I hope to start a form of “Lent Madness” with my church next year. It has been informative and entertaining. Thank you!!! Just remember, if you copy too much of Lent Madness with your church, the Supreme Executive Committee will sue you into oblivion. But that said, enjoy! That’s my kind of grandma! Well….I am speechless over the UNSAINTLY VIBES diatribes unleashed on the Executive Committee as unchoice language is actually one..and the only.one. at that, of things I’m striving to give up for LENT. Therefore, I am extremely limited in my response to these…..people…oh! If only you knew the descriptors beong stricken from my lips. And to think, one of the dissenters is from NOLA…..Give me two breaks..PUH-LEEZE. Just ignore them as they obviously don’t know stuff from Shinola about our daily fun choosing PEOPLE OF GOD as our choices and we love it ! Love it ! Love it ! And we’ll even love it more tomorrow..unless you choose one of …them ! I love Lent Madness! People need to lighten up. Reading the biographies of the saints each day is very educational. It is a fun way to connect. If it’s not your cup of tea, don’t do it! Criticism, Schmiticism. The REAL unsaintly vibe around here is for those of us who didn’t get our LM Saintly Sixteen email this morning! Reading the Joan v. Mary commentary this a.m. it looked like I wasn’t the only one (although I _did_ get the email for this post). What’s up with that? We’re not sure what happened. Our emails rely on WordPress, and they must have had a glitch. Hopefully it’ll work tomorrow. Sorry! I”m still giggling over your response regarding the leadership of the Episcopal Church. And the Tebowing thing. That was really good. Wonder if the Supreme Executive Committee has seen the book “Between Heaven and Mirth” by James Martin, SJ? I have not read it, but I like one of his other books… sounds like a book you might enjoy! Well! Ahem (cough). Everyone at my church LOVES Lent Madness! We are CRAZY about it! What is that warm sensation I feel? Oh, look, my toes are roasting in hell. Whatever! Be thankful the warm sensation isn’t from a warm liquid trickling down from all the laughter. May the good Lord deliver us from grim-faced Christians! Love Lent Madness. Thank you, Supreme Executive Committee, for your fine work. 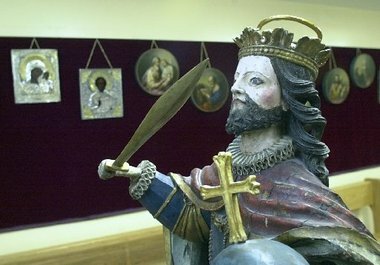 Something confuses me, though in this report of unsaintly vibes: The photograph bears a remarkable resemblance to King Friday XIII from Mr. Rogers Neighborhood. Is he wielding power behind the scenes? I knew he looked familiar! Younger, but I’m 95% sure it is indeed King Friday. I’ll be 100% sure if he makes a guest appearance (and royal pronouncement) on Monday Madness. Lent Madness detractors’s children will be punished to the third and fourth generation. (Maybe those who voted against St. Nicholas too… not as sure about that one). My dear, if God doesn’t have a sense of humor we’re _all_ hosed! But I’m confident She does. I’m loving the whole thing. And, as a sports-blind person, I’m finally understanding that whole bracket/seed thingy. You guys ARE like Colbert! I knew there was a reason I like this blog or whatever you call it! I saw the Facebook post when it appeared and loved your response. Well done, SEC! We are all having good, clean fun here learning about and discussing saints from all eras and I am grateful for the efforts of all those behind Lent Madness. Thank you! I just wish there were some way for Lent Madness to continue year ’round. That’s not possible — so I will content myself by enjoying a number of months’ inspiration from the life and times of the winner of the 2012 Golden Halo. I will remain hopeful that Tim and Scott are able and willing to schedule a tour for the spirit of madness. If CNN found a way to spawn dozens of 24/7 news networks, and ESPN figured out how to get people to sobscribe to “vintage” sports rehashing, then surely in their boundless wisdom, the Supreme Executive Committee could find some way to extend our MUCH needed education and edification beyond the limits of Lent. Great thought! Before our Vicar was Vicar, he had classes on multiple people of faith, active in the world taking God’s message to everyone they thought should know Jesus. I’m sure you can continue this fun way to provide us with church history and who took the “word” where. Keep on with the fun and insight! And Jesus, thank you for being fully human & fully God …. I do not doubt that God has a great sense of humor, laughing often and heartily! Ah, she’s just cranky ‘cuz her favorite saint lost in the first round. Or perhaps she’s never seen a platypus. God is a funny, funny God. Thank God. Keep up your wholly holy work! Thanks for livening up my daily routine and introducing me to some of the saints I had not read about prior to this. (yes I know all members of the body of Christ are Saints). I think maybe we need a Lent Get-A-Sense-of-Humor site. I think Lent Madness has been great and has encouraged a lot of folks to learn a few things about the saints. I look forward to it each day. Grace Episcopal Church, Norwalk, CT supports Lent Madness! It is brilliant! My Lenten discipline is to laugh more. It’s good for the soul that spends way too much of life fretting and worrying and planning and trying to get things right. Thanks, Supreme Ones! So glad you brought in the 3 legged stool. LOL, I enjoyed every comment. Thank God for humor and so many things. Love Lent Madness, folks need to lighten up! I have found this to be a great teaching tool as well for my parishioners about the saints. thanks for putting this together! If they don’t like it they don’t have to become part of the experience. They don’t have to even follow it on facebook. Keep on “dancin’ before the Lord”, BOYS! If it was good enough for David, it’s good enough for us. And replacing the worn out term “genuflecting” with “Tebowing” is brilliant. I came to the Episcopal Church late in life after being born and raised Methodist. I remember when I attended United Theological Seminary, The Methodist one of course, I had a professor named Dr. Ed Burtner. Dr. Burtner taught the class that I still refer to as Preaching 101. I take from all of this that some who consider themselves Christians might just be a bit full of themselves. In addition a little bit of fun goes along fine with being a Christian. I wish that Lent Madness’ detractors could have sat beside me in Dr. Ed’s class. They might see things a bit differently. When asked what St. Teresa would do if she met the devil, she is reported to have said: “Laugh at him!” Laughter & taking ourselves lightly’s just what this is all about! Carry on friends! Wow. I sure hope nobody thinks THAT Maria is THIS Maria. She’s kinda grouchy when it comes to God having a sense of humor! P.S. This Maria is having a lot of fun with your witty repartee. I am shocked! Shocked, I tell you, that someone thinks that Episcopalians are having fun! The very idea is ludicrous. Are we not God’s Frozen Chosen?! I spent my weekend Lent Madness Withdrawal thinking about LM and comments along the way from people offended by the competitive premise and the encouragement of ‘smackdown’ and trash talk language. I get where those folks are coming from. Language matters. But this is *clearly* all tongue-in-cheek and meant in fun. It would be quite something else if this contest had the remotest chance of erupting into real sectarian violence or even into a bona fide virtual (?) internet flame war…but it is a tribute to the benevolent dictatorship of the Supreme Executive Committee and to the participants themselves how civilized the discussions have been. One does not always find such restraint and mutual respect (let alone outright joy!) operating within a Christian community. It should be celebrated, not reviled! I love Lent Madness…..love the “boys” and love the ignorance of the nay-sayers. Why are they on the site if they are offended? I am truly enjoying Lent Madness. I have learned a lot about many saints I had never heard of, Plus you are helping me survuve without what I denied myself for the lenten season, all meat save fish, and CHOCOLATE, my biggest sin. Lent madness is keeping me sane. Thank you both for all the fun. I pray for those born without funny bones. So very sad. I agree with a few others – it’s educational & fun. As a Christian – I enjoy learning a little about the various leaders, who in some cases, help build the faith. I haven’t take the time to read every single comment but I don’t really need to after reading the main post. It pretty much speaks for itself. During a meaningful Lent, we are not to wear our penitence on the outside, only the inside, where God sees it. We are not to try to outdo each other in looking mournful and grim. We are to be witnesses of God’s love and Spirit during Lent, and that is what Lent Madness does. It is a cheerful spirit we show to the world, not sackcloth and ashes. So, I’m with the rest of us who “get” Lent Madness. Lighten up people; put away your “Woe is me” attitude and vote for the Fabulous 16. Tell us your “bracket” and cast your vote, for some Lenten Levity. What? You’re saying Stephen Colbert is pompous? Gasp! For those people who are unhappy with Lent Madness, methinks you are taking yourselves a bit too seriously. Although Lent is penitential, we can still have a little bit of whimsy. Relax and enjoy. Lighten up Francis! or is that St. Francis? Personally, I was really excited when my priest mentioned this in the weekly e-pistle to the parish. I had no idea what I’d do for Lent this year and here lands a great way to learn about the saints – something about which I’ve been woefully clueless. So you have my thanks! @markstra: There is NO scriptural support for driving a car either, yet for some, driving a car has been the primary means for people to get to the church, much the same way that the time of Lent has been a way for people to come to know Christ. And Lent Madness – well, what a fun way to learn about our ancestors in the faith! Sounds like someone turned the milk in Maria’s cereal yesterday morning. There are always sour cranks who will make it their business to scold everyone in creation for enjoying something. One can only feel terribly sorry for such people and hope that they learn to laugh at some point in their lives. One thing I’ve always loved and admired about Episcopalians is an attitude that their religious practice (and perhaps their faith) is not only more than capable of weathering humor or skepticism, but may also emerge from the experience an even more exciting, dynamic animal, richer for the encounter. I would like to thank you for your Lenton Madness. I know Lent is to be traditionally a time sacrifice and meditation. But please people, remember to wash yourself, comb your hair, and do not appear self-righteous. God loves a cheerful giver. Why ever else would he have given us that wonderful, uplifting, healing gift of laughter! Archbishop of Canterbury Rowan Williams must be following Lent Madness. He was so impressed with Mary Magdalene’s trouncing of Joan of Arc that he was moved to accept the post at Magdalene College! I just have to say thanks to you this is the best Lent I’ve ever had. I’ll be back next year. I was so excited to find out their was a saint from my home state: Oklahoma. Go David Oakerhater! I have learned so much about saints I wasn’t familiar with – all because of Lent Madness! I think it’s educational, fun and done in a reverent manner. For those who think otherwise, I think you’ll be surprised to find that God loves to see his children having fun! Hooray for Lent Madness and the S.E.C!